Despite warm weather, Utah’s “Hell of the North” lived up to its reputation as one of the toughest road events in the state. The event was only 50 miles (10 laps) for the Pro 1-2 men, but that proved long enough with over half the field suffering flat tires and multiple crashes. 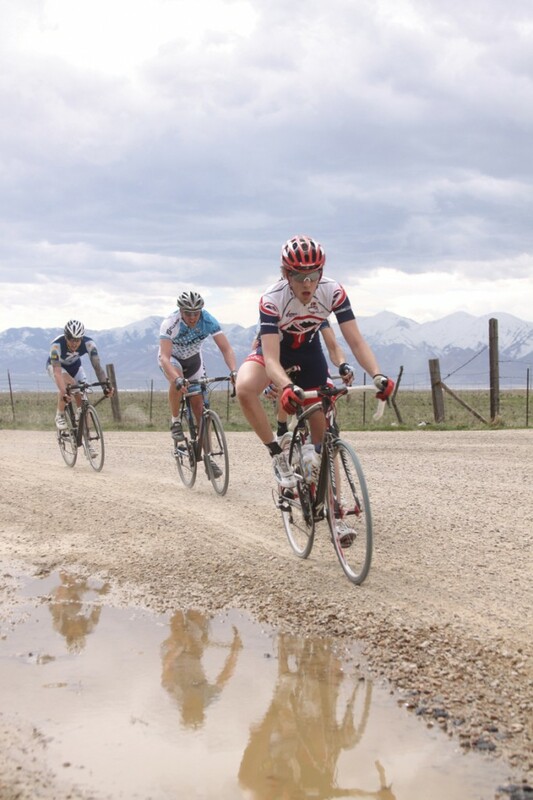 Held on the northwest edge of Salt Lake City, the tough five mile flat circuit travels over 1.75 miles of an extremely rutted dirt road. After a tough back and forth battle between Ski Utah-MarketStar and Canyon Bicycles, it was the lone ranger in the front group Peter Archambault of RMCC/Cyclesmith who emerged victorious in a three up sprint ahead of Canyon teammates Mike Sohm and Bryce Young. Unfortunately, the finish was not without controversy as many in the field were confused on laps as the event failed to provide lap cards. You might think that even a bike racer could count to 10, but as the author was one of those confused, you may be overestimating us…Therefore, there was a sprint after 10 laps (which counted) and another after 11. The women’s Pro 1-3 40 mile event lacked similar controversy, but was no less hotly contested. As with all races throughout the day, the field shattered. Sarah Kaufmann (Elete Electrolytes) attacked on the first of six laps and soloed to an emphatic victory nearly four minutes ahead of Laura Howat (Ski Utah-MarketStar) and Kelsey Kooreman (Primal Utah).